Bruichladdich 1989, Cask 44, Oh My Fu$%ng God! Yeah that's a tasting note for "holy crap thats good!" The Botanist Gin + E150a!? A day in the life interview with Bruichladdich’s Christy McFarlane. 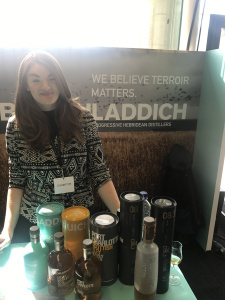 The “ A day in the life” series continues with a behind the scenes feature, although anyone who has watched any of the live tastings from Bruichladdich or had the pleasure of meeting some of the team at festivals may already know Christy. Christy is generally one of the hard working people behind the scenes trying to make the live tastings go smoothly and asking Adam the questions from social media..
A day in the life with Christy McFarlane. How long have you been working in the whisky industry? I started working in Ardbeg’s visitor centre at 16, and started doing tours at 18, around nine years say? Can you tell us about your day to day job and what is involved.